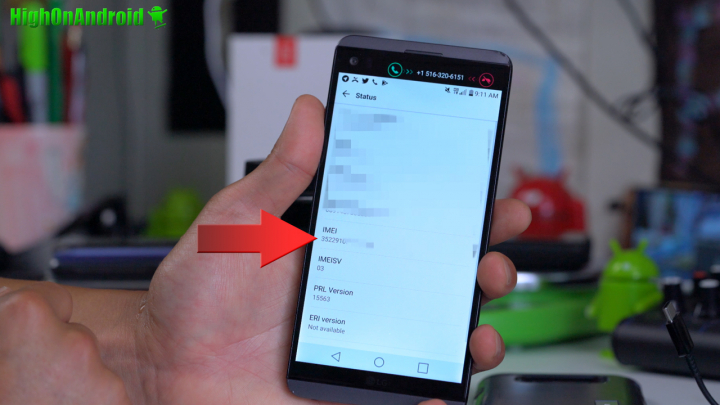 How to Unlock Bootloader on LG Android! To unlock bootloader on LG Android smartphones, there are several different methods. 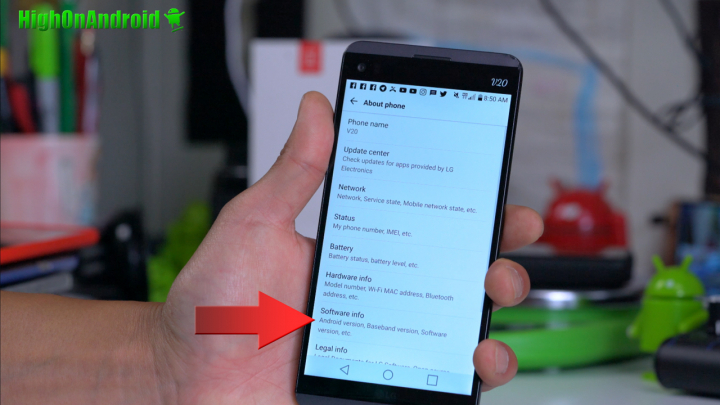 The easiest method is the official bootloader unlock method supported officially by LG. For all other LG smartphones, you will have to find an unofficial version floating somewhere on the interwebs. 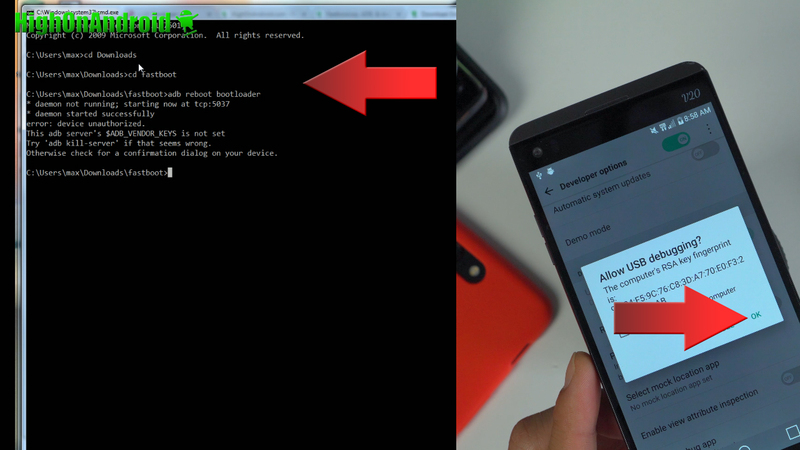 NOTE: Unlocking bootloader will ERASE EVERYTHING ON YOUR ANDROID! Backup anything important before preceding, you have been warned! This bootloader unlock method will work on the following devices, and also you can check here(http://developer.lge.com/) to see if your LG smartphone is officially supported. 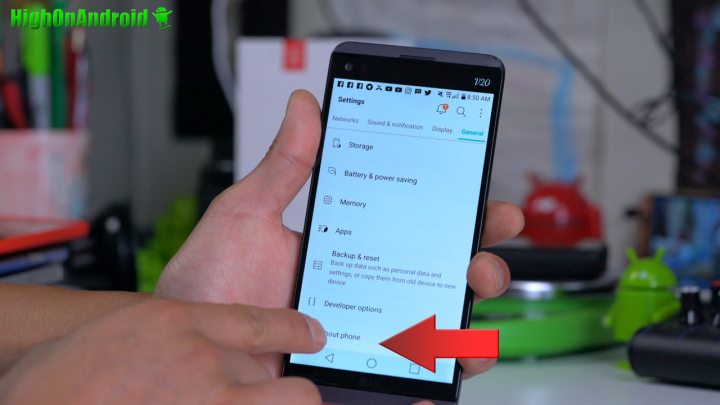 For all other LG phones not listed here, please Google it. And if you do find a good unofficial method worth mentioning, please leave them in our Forum comments box and I will update the above list to help others. If your LG device model number is supported, please follow the rest of instructions. Step 1. 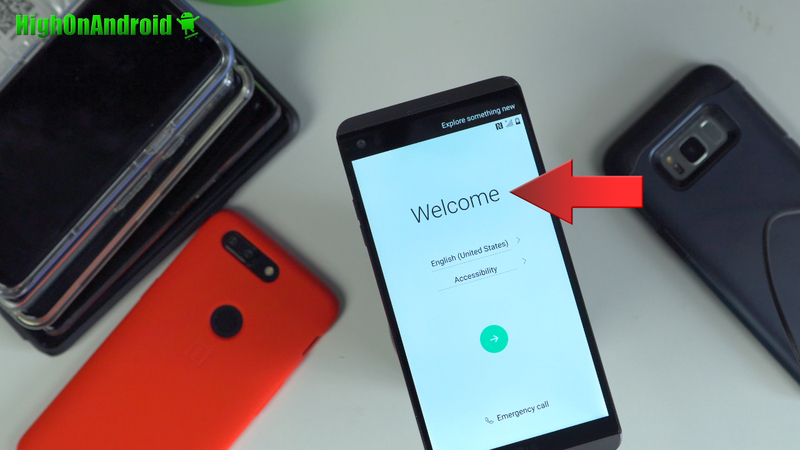 Let’s find the IMEI number of your LG smartphone. Go to Settings->About phone on your LG smartphone. Tap on “Status” or the menu button that shows your IMEI. 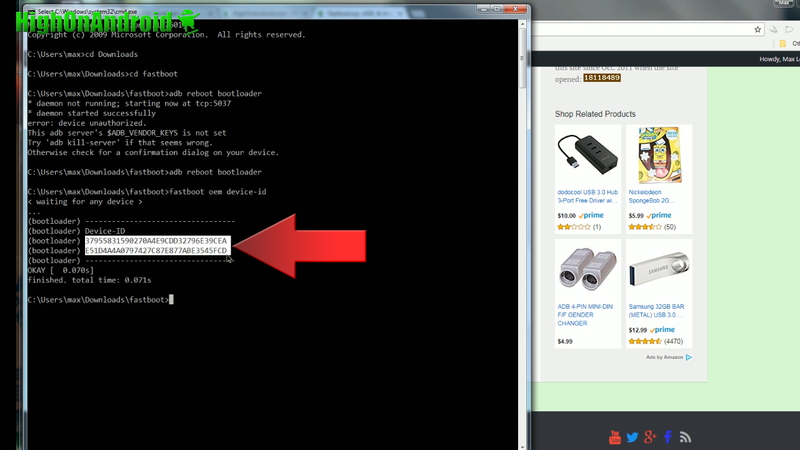 Write down your IMEI number as we will need it later to unlock the bootloader. Step 2. 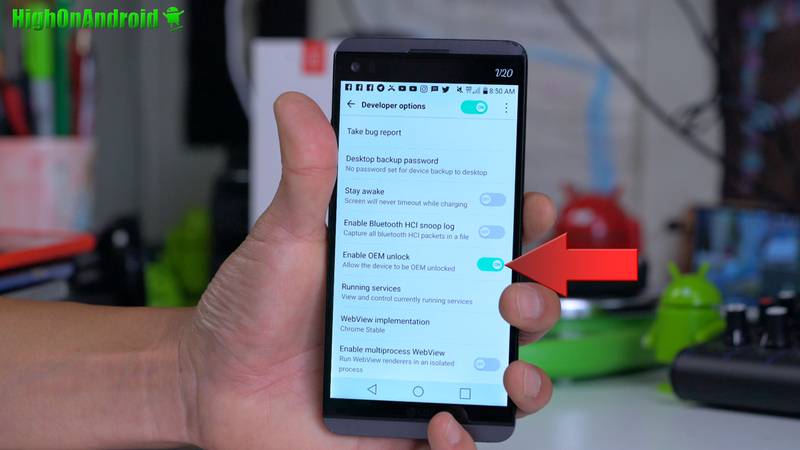 Next, we will enable Developer Options to turn on OEM Unlock and USB Debugging. Tap on “Build number” about 5 times until it says, “You are a developer” or something similar. 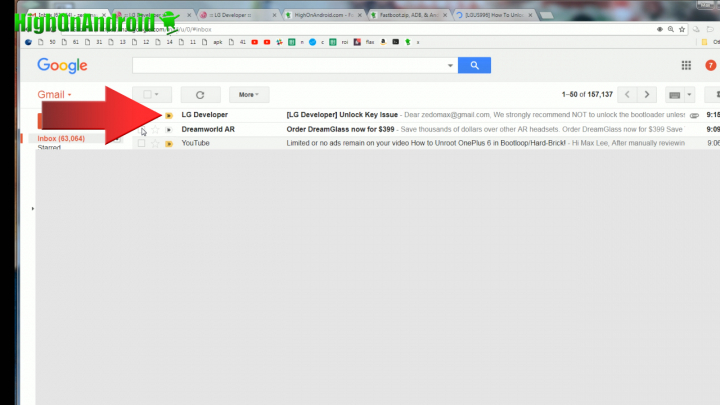 Tap the back button once or twice and you will see a new menu option called, “Developer options”. Tap on that. Make sure “Enable OEM Unlock” is checked ON. 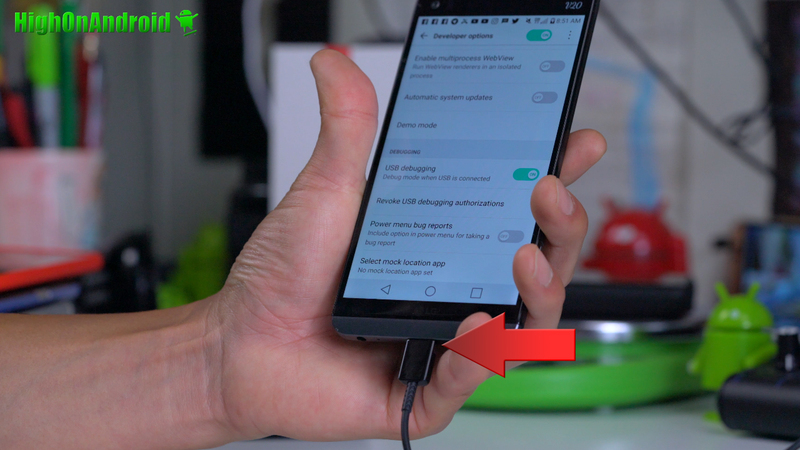 Also make sure “USB debugging” is checked ON then connect a USB cable from your LG phone to your computer. Step 3. 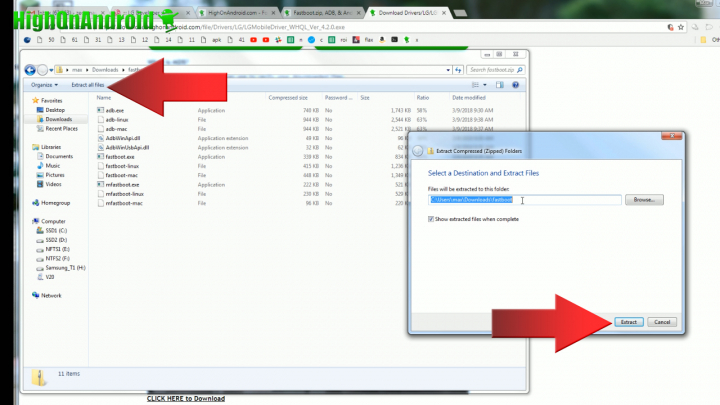 Download fastboot.zip and LG drivers for Windows. For Mac or Linux, no drivers are required. Run the LG driver program which will install the appropriate drivers. You can verify your Windows drivers are working by checking Device Manager. You should see something like “LGE Mobile ADB Interface”. If you still don’t see it, try unplugging then plugging your USB cable back into the computer. Step 5. 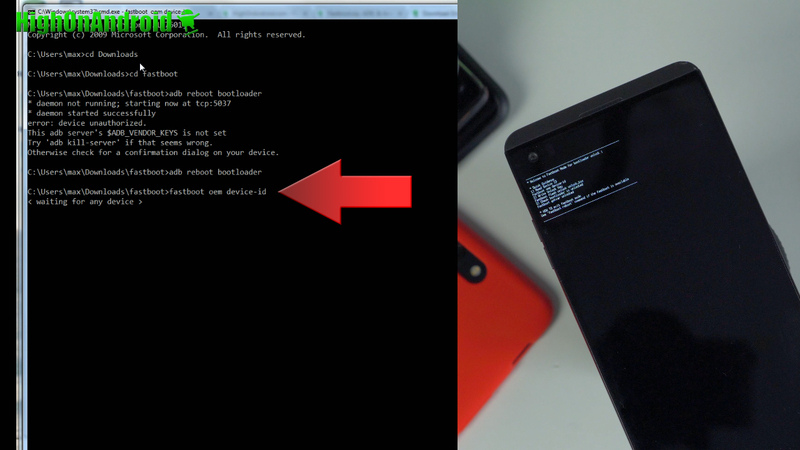 Next we are going to use ADB commands to reboot the phone to fastboot/bootloader mode. 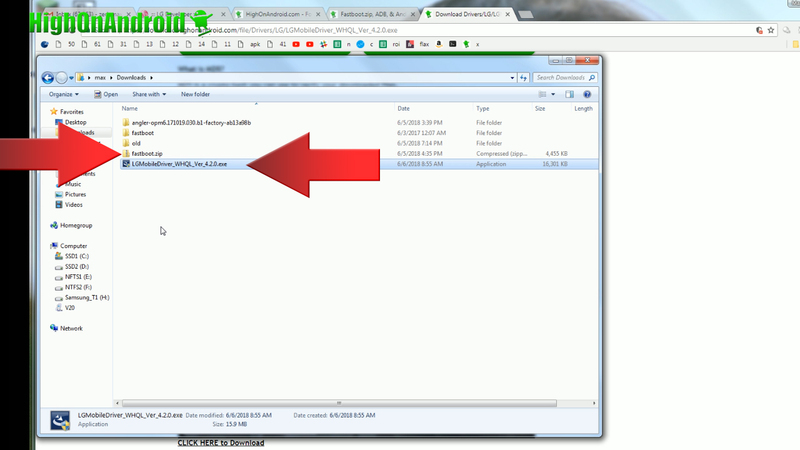 For Windows, open a command prompt by typing “cmd” in the Windows search bar. For Mac or Linux, open a terminal. If you don’t know how to do this, you can Google it. Note: “Downloads” folder is the default download folder for most computers. If yours is different, type that instead here. Note: The “chmod” command is required to change file permissions on both Mac or Linux before you can execute them. Note: The “sudo” is required if you are running your Linux system as a user. You can also simply type, “sudo -i” to enter root mode then you don’t have to type sudo in front. If you get an error, check your phone screen and make sure to hit “OK” if you see “Allow USB debugging” pop-up screen and try the ADB command again. Step 6. 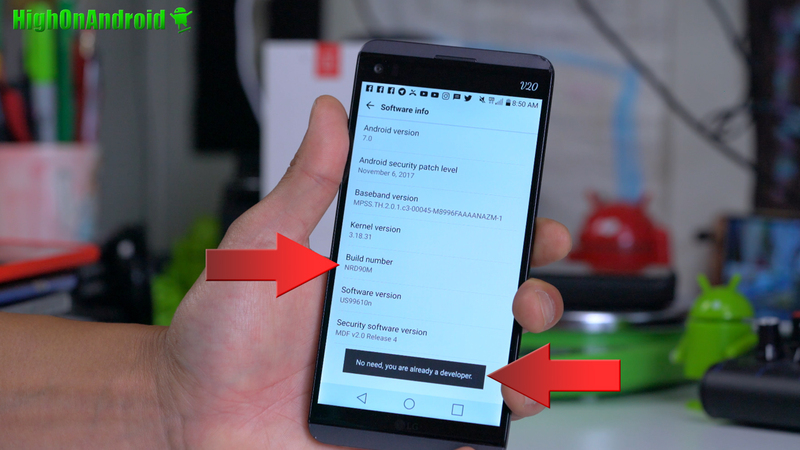 Next, we are going to get the device ID of your LG smartphone so type the following. 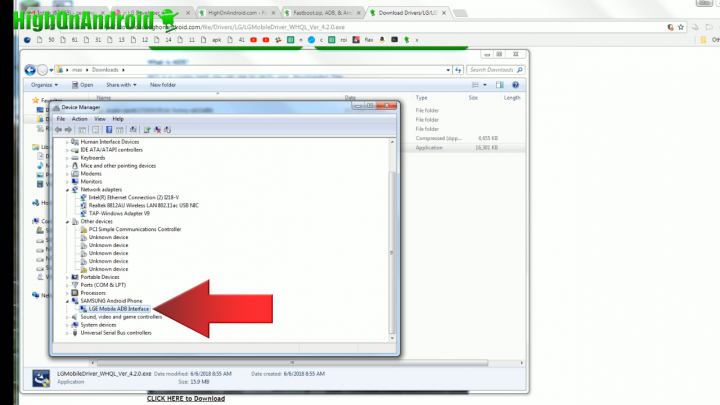 If you get an error, you may have to re-install ADB drivers manually using the Android ADB drivers here. Most likely not going to happen but if it happens to you, refer to my video tutorial on how to install it manually and fix this issue. 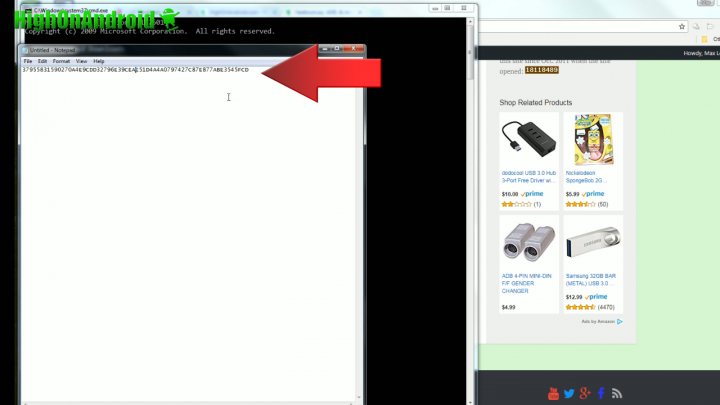 Copy and paste the 2 lines as shown below into a Notepad. Step 7. Okay, now we can get the unlocking bin file from LG now with the Device ID and IMEI. 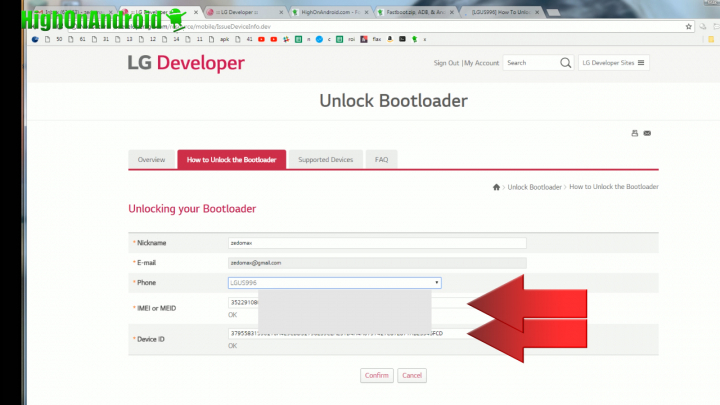 Go to LG’s Bootloader Unlock page here, then click on “How to Unlock Bootloader page” then click on “Start Unlocking the Bootloader” button at the bottom. 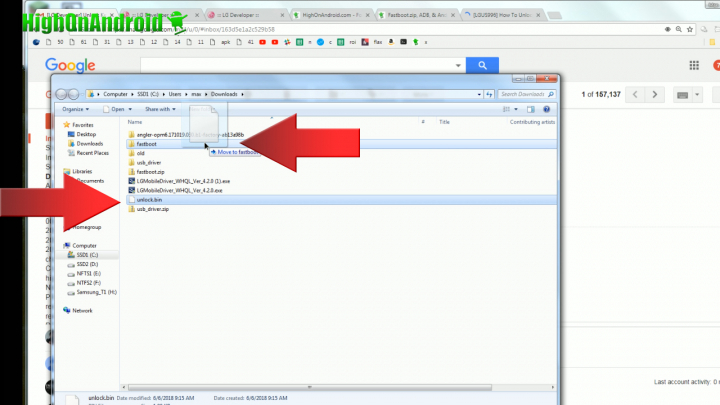 There, you can paste your Device ID and also copy and paste your IMEI number you wrote down earlier in this tutorial. 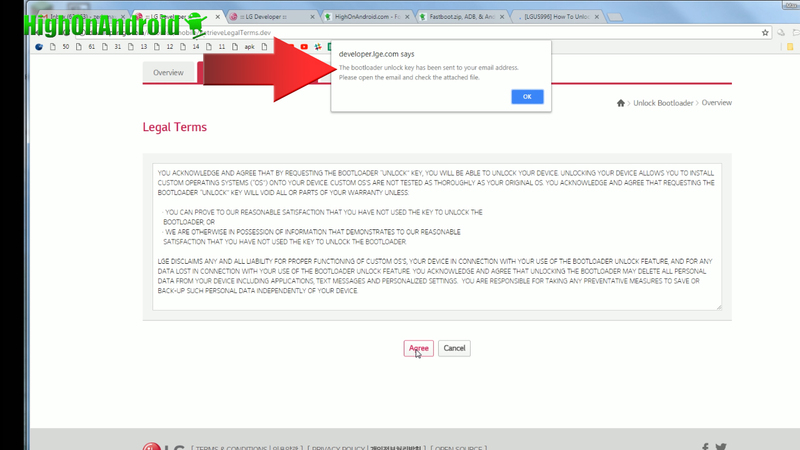 Click on “Confirm”, and click on “Agree” on the next page and you should get a pop-up window saying, “The bootloader unlock key has been sent to your e-mail address”. 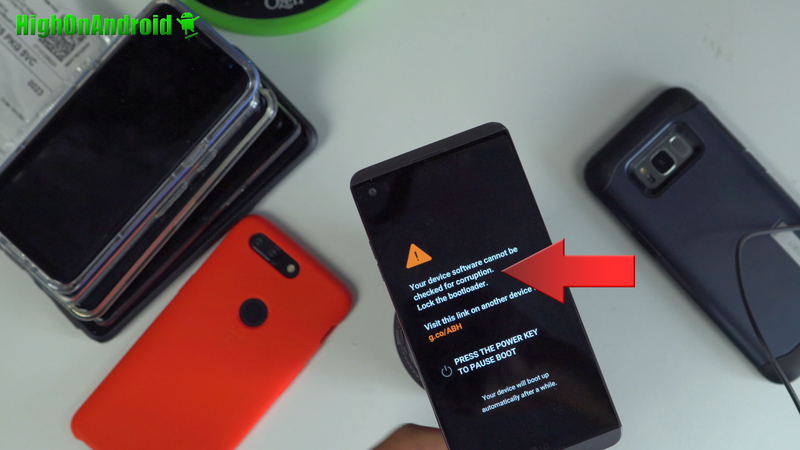 If you get an error, double-check you chose the right phone model and also double-check your IMEI number and Device ID. Step 8. 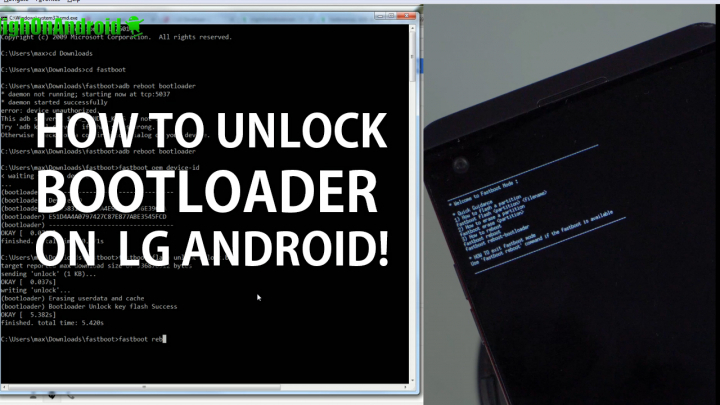 Let’s now get the unlock bin file from LG then unlock the bootloader! Check your e-mail inbox and LG should have sent you an e-mail. There should be an attachment called, “unlock.bin”, this is your unlocking bin file. 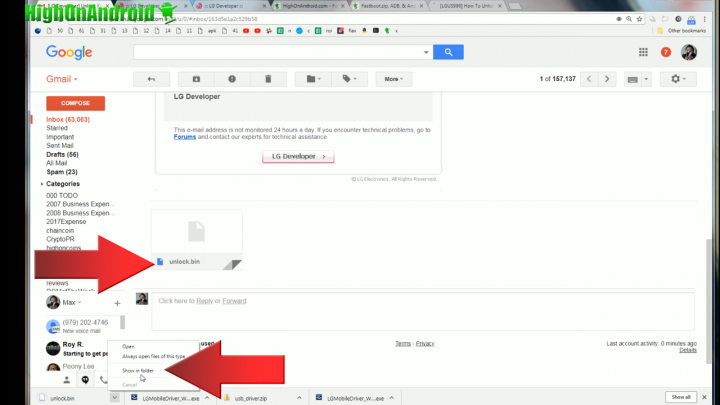 Download the file. Click and drag the file into the fastboot folder. Go to your command prompt and type the following. Your LG phone should reboot and if you see a warning screen like below, you have successfully unlocked the bootloader! Congratulations! Once rebooted, you should be see a Welcome screen. 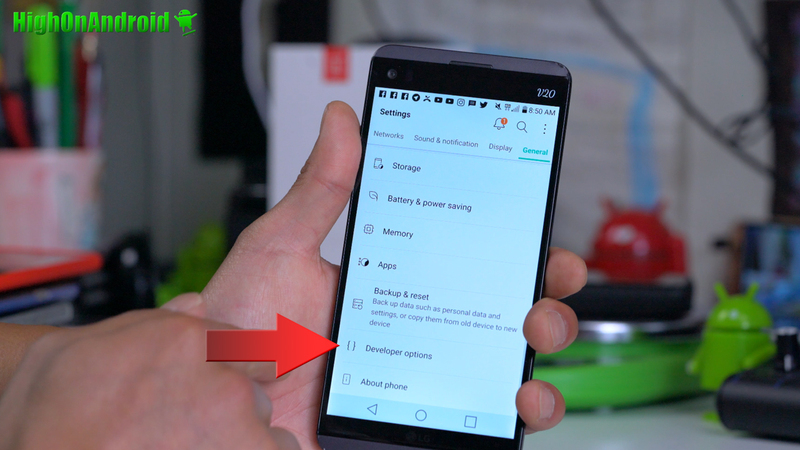 You should now be able to easily install TWRP recovery and root your device using Magisk. I should have that tutorial up soon!